Chuck Blore is the program director who brought Top 40 rock ‘n’ roll to the major market masses. His rise to fame began as a DJ on Tucson’s KTKT and San Antonio’s KTSA, and as program director for Gordon McLendon’s KELP in El Paso. It was at KELP that Blore developed the fast-paced, jingle-filled, personality driven Top 40 rock ‘n’ roll format that was dubbed “Color Radio.” In 1958 he moved to Los Angeles, where he put KFWB on the map and became the first to establish Top 40 rock ‘n’ roll in a major market. 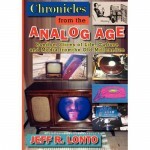 Blore chronicles his years at KFWB (and sister station KEWB in the San Francisco Bay Area) in a breezy collection of anecdotes, rather than a detailed history, but readers will gain valuable insight into the endless details involved in creating and maintaining a complex and unique radio format. KFWB’s influence and reach were unparalleled in the Los Angeles market, and the impact of Blore’s innovations (along with the DJs, business team and operating staff he trained) reverberated throughout the industry for decades. 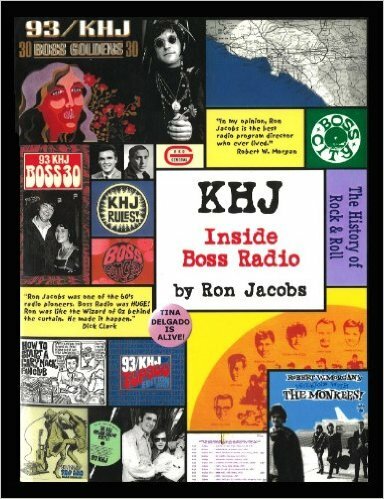 Originally published in 2002, and republished as an e-book in 2010, Ron Jacobs Inside Boss Radio is the story of Top 40 radio’s highest peak. From 1965 through 1969, Jacobs served as program director for KHJ-AM, and together with the legendary radio consultant Bill Drake, created the Boss Radio format that conquered Los Angeles and was duplicated successfully in markets around the country. Jacobs covers the format’s origin, the boss jocks who brought it to life, the promotions that furthered KHJ’s reach, and the day-to-day workings involved in seeding and growing a format into a competition stomping dynamo. The story begins in Fresno, where, as program director for KMAK, Jacobs battled head-to-head with Bill Drake, who was consulting for station owner Gene Chenault at KYNO. 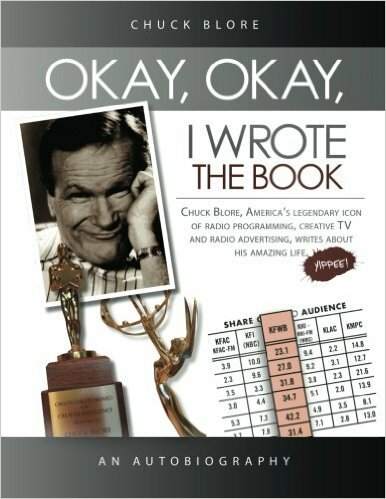 Rock ‘n’ roll had reached the major markets through Chuck Blore’s “Color Radio” Top 40 format at KFWB (a time documented in Blore’s Okay, Okay I Wrote the Book), but by the mid-60s, Blore had left KFWB, and KRLA, with Dave Hull, Bob Eubanks and Casey Casem was getting hot. Drake had decamped from Fresno to work at KGB in San Diego, and upon moving to KHJ he brought in Jacobs as program director. The station switched formats in May 1965, rechristening Los Angeles as “Boss Angeles,” and rewriting the mechanics, content and focus of Top 40 radio. Jacobs’ book is in two parts. The first half of the book is a multi-person verbal history that threads together stories and anecdotes from many of the original characters. The second half, and really the meat, is the blizzard of memos that Jacobs rained upon his DJ staff, announcing changes to the hourly clock, pushing upcoming promotions, nitpicking the details of their on-air work, highlighting records, discussing ratings and always reminding them to program their music (particularly the “goldens”) with thought and flair. The verbal history is difficult to follow the first time through, as the characters aren’t drawn with enough detail to become sticky in the reader’s head. But after plowing through the memos, you’ll want to circle back to the book’s first half for a second read. KHJ’s innovations and methods were many, including 20/20 newscasts, fresh and numerous promotions (including The Big Kahuna, Mr. Whisper and Location X), a KHJ-branded television program, premieres, exclusives, musical specials (such as 1969’s 48-hour The History of Rock ‘n ‘Roll), and teen-targeted day-parting. Jacobs was relentless in driving towards a “standard of attempted perfection,” and his drive was rewarded by towering ratings. The format was technical, complex, intricate and always under revision. Jacobs’ biggest headache seems to have been the fight against complacency as the station quickly rose to #1 and crushed its competition. By early 1968, KFWB switched from music to news and KRLA was cutting shifts and eventually turned to automation. What’s missing is an explanation of the philosophy or stimulus that led to many of the changes outlined in the memos. The reader is often left to guess what Jacobs was responding to, or exactly what he was trying to accomplish, but even for Jacobs, annotating the memos nearly fifty years after the fact may just not have been possible. Still, it would be fascinating to have him break down a few of the format tweaks, to give lay people some deeper insight into the day-to-day mind of a program director. Also missing from the memos is Bill Drake’s voice, and so the daily dynamic between consultant and program director is not seen. Readers might be inclined to think this book is a put-on, but Adam Nayman’s apparent sincerity, obvious writing talent and impressive analytical dexterity is convincing. Convincing that he means it, if not necessarily right. Nayman is a 20-something film critic, and his well-researched treatise on Paul Verhoeven’s legendary 1995 box office bomb is a thoroughly entertaining read, if not necessarily a completely convincing defense. 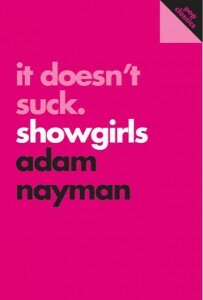 Nayman is among a group of critics that have turned the table on the film’s initial reception, suggesting that Showgirls isn’t just not bad, it’s a modern classic that was sorely misunderstood by both reviewers and viewers. The key to appreciating Showgirls is, paraphrasing author Anne Rice, to interrogate the text from the right perspective. Nayman’s approach isn’t tongue-in-cheek irony, simple-minded contrarianism, or the mental slight of hand of Jason Hartley’s Advanced Genius Theory; his appreciation is unabashed fandom. Nayman argues that the careers of director Verhoeven and writer Joe Eszterhas anticipate their work in Showgirls, and that analysis of the film itself reveals that the filmmakers knew exactly what they were doing. Verhoeven is posed as a satirist and provocateur, the film’s lack of subtlety as an artistic choice, and the laughter it generates for over-serious scenes as an opportunity rather than an accident. If one accepts the film’s most ridiculous moments as intentional, rather than unconscious mistakes, a number of critical analyses begin to flow. First and foremost for Nayman are the film’s mirror-like, self-reflexive qualities. Starting with the film’s star, Elizabeth Berkley, Nayman suggests that Showgirls provided an opportunity for her reinvention as a grown-up actress that parallels the film’s main character, Nomi Malone. But as Nayman continues to ascribe intention to what might easily be a lack of care or perspective, one starts to wonder if Occam’s razor is a more straightforward explanation of the parallels. Berkley and Malone both aimed for grown-up, but ended up in entertainment that was merely adult. It’s possible that Nayman is seeing depth where there are really only artistic shallows, and he’s seeing causation where there is really only coincidence. Nomi’s relationship with her roommate might be subtle and complex, but it might simply be poorly thought out and rendered. The homophones for Nomi – “Know Me?” and “No Me” – could be clever entendre, or they could be nothing more than on-the-nose, inch-deep word-play. He argues that the film is too self-conscious to be camp, but it’s difficult to overcome the feeling that no matter how many of the film’s worst moments you explain away, the film still manages to be worse. In his revelatory first book, Futurehit.DNA, music industry insider Jay Frank explored the impact that modern recording and digital distribution technology are having on popular music. Rather than guiding readers to creating more artistic music, he took on the mercenary’s role of advisor-to-the-would-be-popular. He explored the ways in which modern listeners discover and consume music, and his insights as the former head of Yahoo! music yielded useful ideas for garnering listeners and the public recognition (e.g., chart action and sales) that goes along with all those ears. In this follow up, Frank ups the promotional ante and lowers the moral barriers. This collection of ideas is even more mercenary in nature, and though it will help you maneuver around a lack of a label, industry experience or contacts, it does so in part by teaching you to use, and in several instances, game, Internet-based promotional channels. Frank builds upon the premise that the average music listener is not a fanatic, and that their music discovery is viral- and marketing-induced. As in his debut, he provides interesting analysis of how the music discovery curve has changed, and how artists who want to be discovered need to adapt. Growing an audience with mechanisms other than music and live performance is a task many musicians are loathe to undertake, and the book’s focus on non-musical mechanics is sure to alienate a few. But the ease with which all musicians can distribute their music on the internet has made it more difficult for any one musician to be heard, and working out-of-band is a basic necessity to a modern music career. Many of Frank’s ideas – networking with fans and artists to grow your fan base, giving away music to expand your business, treating your most ardent fans as your most passionate customers, using contests to build a mailing list, optimizing your website for search results – are standard marketing fare. Where he gets clever, and some would say less ethical, is in recommendations for juicing your YouTube placement by watching your own videos, pumping up your sales figures (and thus your chart placement) by buying your own songs at digital retail, and even buying Facebook fans (the latter of which he disclaims “I’m not for that, but it is a consideration”). One could see these as digital versions of practices common to the pre-Internet record industry, but their availability to all doesn’t make them any more savory. Still, Frank may be right that this is what it takes to succeed in today’s mainstream. 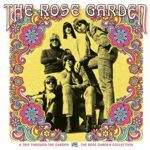 If you grew amidst the 1960s folk revival, you may well remember a favorite Pete Seeger, Burl Ives or Johnny Cash record of great American folk songs. You might have been schooled by the Dillards (in the guise of the Darling Family) on The Andy Griffith Show, had parents who sang these songs as you drifted off to sleep, sang folk songs at camp or had a progressive grade school teacher who introduced these songs at music time. But it’s probably been a few decades since folk songs were central to your life. Of course, you’ll still hear many of these titles on Prairie Home Companion and at bluegrass festivals, but their mainstream circulation has dwindled, pushing their legacies to the fringe. And that’s a shame, because these are great songs, rife with historical significance (both in their creation and in the stories they tell) and deep musical pleasures. Jason Hartley’s debut book is interesting and infuriating, ridiculous and thought provoking, challenging and dismissible. “The Advanced Genius Theory” began life as an on-going conversation between Hartley and the theory’s co-inventor, Britt Bergman, initiated in a college hangout and developed in the hallways of Spin magazine and on Hartley’s Advanced Theory Blog. The theory’s basic tenant is that genius doesn’t decay; it only advances its manifestations beyond that which the rest of us can understand. In Hartley’s topsy-turvy world, Lou Reed’s Metal Machine Music isn’t an incomprehensible attempt to fulfill a contract, it’s a record so advanced that the typical Velvet Underground fan can’t recognize its brilliant anticipation of industrial music. Bob Dylan’s mid-period albums, not to mention difficult-to-comprehend commercial endorsements, aren’t signs of a creative doldrums; they’re the products of a genius at work. What immediately comes to mind is that, despite their declarations to the contrary, the proponents of the theory are little more than contrarians. The contortions to which the author resorts stand in contrast to the more generally accepted interpretation: inspiration is fleeting, genius decays, and many artists’ later works pale in comparison to their peak moments. The writing teeters frustratingly between humor and argumentation, invoking false analogies, hasty generalizations, straw men, affirmed consequents, and other logical fallacies. 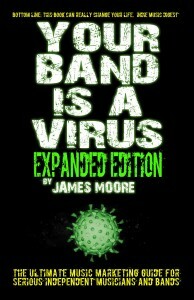 The book is filled with unsupported hypotheses, which can be either funny or irritating, depending on your particular opinion. The book works best when the author’s tongue is planted more firmly in cheek, such as for his descriptions of Miles Davis’ film and ad work, and his wrestling match with Sting’s post-Police catalog. The more ridiculous the assertions, the funnier the book gets. Perhaps the most fun you can have with the theory is applying it self-referentially to the book itself. Hartley, for example, criticizes some writing at VH1’s Best Week Ever blog and dismisses artists like the Replacements, the Clash and Eric Clapton by virtue of his personal taste; one is quickly led to wonder whether these are simply too advanced for the writer to appreciate. In that self reflection the theory reveals its value as a conversational instigator, providing a framework for advancing subjective opinions towards supposedly objective evaluations. ‘You don’t understand because you’re not advanced’ is a funny retort, but not exactly a compelling argument. The qualifications of advancement seem arbitrary, and Hartley’s positions often seem calculated to stir up controversy. Then again, perhaps the entire Theory of Advancement is itself too advanced to be understood from only a single reading of this book. That said, Hartley does offer up some compelling analysis. He recognizes that the way in which you relate to an artist’s output depends on the age at which you find an artist and the point you enter their creative stream. Those who latch on early, particularly before fame has been bestowed, relate to the artist differently than those whose relationship is the by-product of such fame. Those who discover an artist in their own young years may find their later disaffection a by-product of changing life circumstances rather than a decline in the quality of artistic output. This isn’t in itself surprising, but the different stages of affection and alienation through which Hartley suggests one can travel is an interesting proposition. Hartley also identifies interesting characteristics common to many mature artists, and though much of the book reads as a contrarian’s apologia, the threads of insight will keep the reader continually off balance. Are they serious? Are they joking? The answer seems to be yes, in both cases. Ariel Hyatt is a music publicist who’s reinvented her practice to utilize social media and other on-line channels. Her book provides nine weekly lesson plans for developing your own on-line profile, including suggestions for optimizing your website, blogging, building a mailing list, creating a newsletter, involving your fans with surveys, and building a “continuum program” that incentivizes on-going purchases. The book is task-driven rather than theoretical, with the first written exercise happening only four pages into chapter one. This necessarily leaves out some detail that might be helpful; for example, the suggestion of offering a free MP3 doesn’t indicate you must clear all the rights (including a mechanical license for cover songs), and the section on optimizing your website doesn’t mention SEO. One could argue these topics are outside the book’s scope, but a pointer to follow-up resources would be helpful. Hyatt stresses the point that many musicians are reluctant to market themselves, and she wisely reframes the musician’s career as a business. She points out that a musician who thinks their only job is to make good music is an idealist who’s not really interested in having anyone hear their work. The steps she outlines will be difficult for some artists to carry out, but taken one at a time, and broken down into smaller tasks, they become part of your larger job as an artist. Her experience as a publicist, and particularly her understanding of what will get people’s attention, is the key to her pitch. She provides compelling advice on how to connect with those who can help advance your career, garnering you more fans, gigs, rehearsal space, private shows, interns, and, eventually, money. She provides valuable guidance on how to make your press kit work on a web site, noting who will be visiting your website and for what purpose.